Communities seeking relief from flooding caused by increasingly intense storms. Fish seeking refuge from warming downstream waters. Parents seeking solace when their child has been pulled into the undertow of the base of an artificial waterfall (aka a dam). Landowners pouring money into failing, obsolete structures, or perhaps pretending they do not exist at all… just waiting for the next big storm to knock them down. The reality of living in a world with a changing climate is real, and we must ensure that we actively work towards making our rivers and communities more resilient. Now is the time to revive our rivers and streams— the lifeblood of our nation. The good news is that we are making progress. It has been another successful year of busting dams and reconnecting rivers and streams across America. Every year the dam removal movement continues to grow stronger. In 2018, 82 dams in total were removed from across the country. Communities in 18 states worked closely with various non-profit organizations, local municipalities, state and federal agencies to remove these dams and successfully reconnect more than 1,230 river miles. Dams were removed in the following states: California, Connecticut, Georgia, Illinois, Indiana, Maine, Maryland, Massachusetts, Michigan, Minnesota, New Hampshire, New Jersey, New York, North Carolina, Ohio, Oregon, Pennsylvania, and Wisconsin. Over the years, the number of dam removal projects have continued to increase, with most removals (1,355) occurring over the past 30 years. Pennsylvania has the highest number of removal projects so far (337 total recorded), while other states nationwide are also stepping up to the challenge (this year’s leader, California, has 148 total removals, followed closely by Michigan with 139). 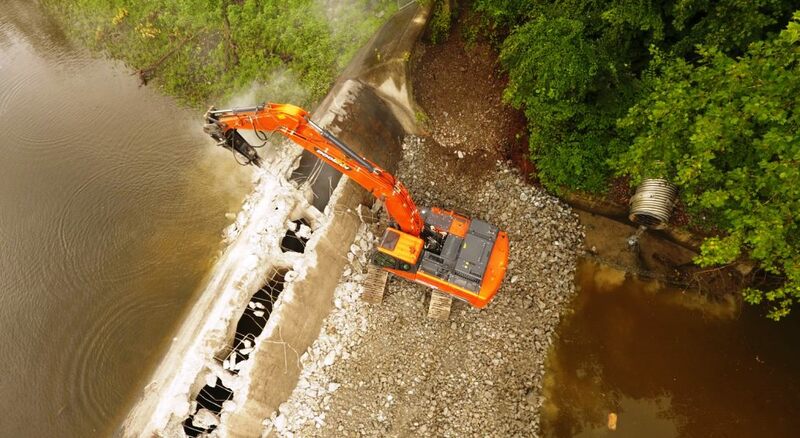 From 1912 through 2018, 1578 dams have been removed in the U.S. to restore fish passage and access to habitat, eliminate safety hazards, and reduce future liability for owners and surrounding communities. For over a century, the U.S. has led the world in dam building. However, like all infrastructure, dams don’t last forever. Twenty years ago this July, Edwards Dam was removed from the Kennebec River in Maine. It marked the first time the federal government ordered a dam removed because its costs outweighed its benefits; it garnered worldwide attention. The Kennebec is a resounding restoration success story, with millions of fish returning every year. It inspired a movement that continues to grow, nationally and globally. Today, many local communities have come to understand that while in some situations dams can be beneficial, they can also cause a considerable amount of harm to river ecosystems. The American Society of Civil Engineers gives the nation’s dams a D grade in its report card on the nation’s infrastructure. Therefore, dams that were once the center of communities powering mills or supplying water for some industry are subsequently being removed after wearing down or no longer serving their intended purposes. American Rivers is supporting the great progress being made by environmental organizations, local municipalities, state and federal agencies, landowners, and others towards reestablishing natural river flow and functions through dam removal. Photo shows the Columbia Dam breach. Credit: The Nature Conservancy.